Your machine has been set to SM911 and, to be honest, you machine is sonically one of the better ones. 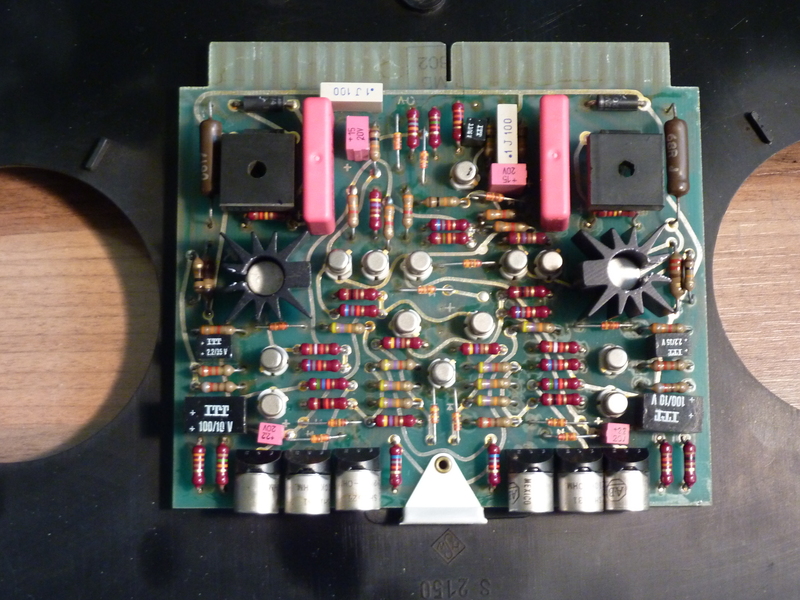 SM900 is a gorgeous tape but, I have tested the new ATR tape on my a80vu-mk1. Not good. I had to rework the record helper and bias amplifiers in order to get enough bias for this +12dB tape (!) After that and one alignment further it’s able to use the tape up to +15dB (equals +3vu). It’s scary .. no noise .. no hiss .. I now have to work on another a80vu-mk1. Two channels DIN is fun but 16 of them is even better. This machine is well known to the Police (the group with Sting, Stewart and andy) This one comes out of the once very famous Wisseloord Studios. With a very late, or early hours, recording when they had fun, the “dodododadada” was recorded. The story goes that no engineer was around and Sting asked the cleaning man to start the recorder. Thanks for adding to my article. I am still very happy with the beast! I have recently been to Wisseloord and visited all studios. Studio 4 aka. ‘The Vintage Room’ was where I was able to admire the 16 track Studer A80 that they use there. I recently got an A80 in very nice condition, apart from some dust which was easily cleaned off. However, I’d be interested in knowing the noise level on yours, as I’m having difficulty telling if I have a problem or not. I send from the outputs of my RME UCX at +4, and getting it back on analog in 7+8, and I can hear a very tape-ish soft noise when I crank the output to 0. Is that normal operation, or should this thing be dead silent? Congratulations on obtaining your A80! Do you record the signal on tape? Mine is dead silent when good tape is used. Yes, I record and repro simultaneously. Have ordered some sm900, so I’m pretty eager to see if that’s a fix. Using old agfa *something* now, pr528 I think. What do you normally use? BASF 911 and also the Agfa PER 528. Mine is calibrated to 911. SM900 should be pretty good too. Looking around for information’s about A80RC I have,I found your beautiful Blog. 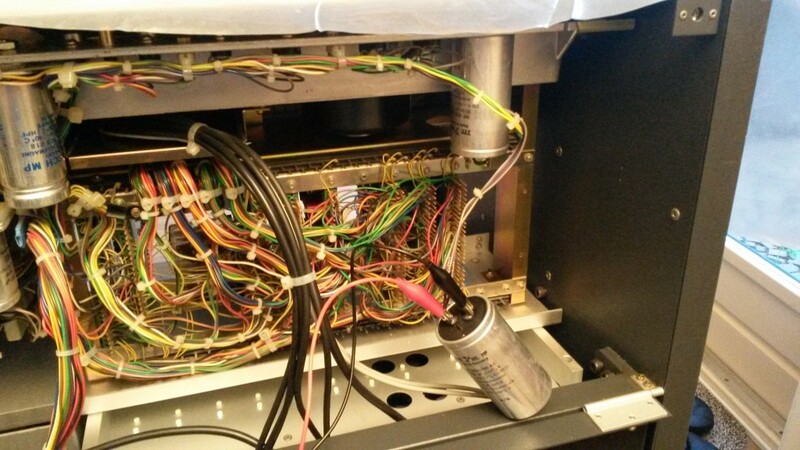 In this moment I almost completed the mechanical inspection of the tape path and changed several bearings. I would like also to change some capacitors of the motors control ,but I have difficulty to find the 20μF and the 10μF both “stud mount”. Do you have their exact voltage and some source for them??? I have searched the archives, but I have been unable to find the parts that I used to replace the motor capacitors. The supplier does not have the records either. Bummer. But I remember that I had trouble finding the right capacitors mount-wise, so in the end I had to do some creative mounting and ended up taping some to the frame, IIRC. Hey, if it works, it works ? I am also very interested in changing some of the bearings, as some are noisy right now. Do you have an instruction for that? I really don’t know where to start. And I would like to know the source of your bearings as well. I am not sure it is the proper ones,so I asked to a friend to see if is ok and I will let you know. My Studer is in very good condition an is recaped also BUT AS YOU SAY creatively.I don’t like it. For example those 2 caps are with tairaps on the chassi. For the pinch roller I used 2 NOS ,for the move roller I used SKF 61900-2Z and for the tension rolers SKF 623ZZ. All the bearings on the machine are : The big ones 10mmID X 22mmOut D X 6mm Width. Now they say a lot of things about the bearings out there. ATHAN Co is a Suder specialist in CA sells the bearings 25USD each http://www.athan.com/cgi-local/store.cgi?product=1479. I don’t know if it’s worth. In the mean time my friend called me and the cap above is ok as replacement for the 10uF cap. If you want some more details let me know. I see that you are well equipped , me too. Anyway, I knew when I got the Studer, that the rollers were far gone and probably soon needed to be replaced. I want to ask you, the SKF roller numbers you used, are those the original spec? Or perhaps even better? And how did you know? Do you think the NATHAN ones are better? Maybe there is a supplier closer by in Europe….. Anyway, hope to hear from you soon. I can’t wait to start to make my Studer more silent! 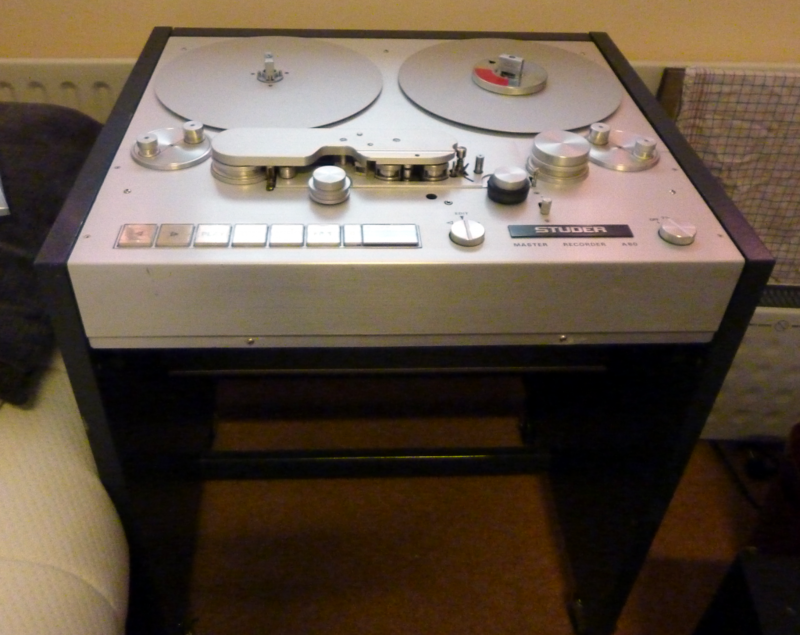 I’m quite new to R2R (apart from my childhood in the sixties and seventies) – and I was fortunate to be given a Studer A80 Master Recorder quarterinch two track machine a week ago. It had some ot the behaviour of yours. I managed to record a few minutes of test talk with it – which sourded really good. But now recording is broken. It spools and plays well, but recording stops slowly within a couple of seconds. I suspect a capacitor. When I depress the Rec and Play button, they do not stay in place – If I hold them, the recorder works for a second, then slows down to a halt, and after a couple of seconds, the take up reel goes in reverse for a second and unreels 4-6″ of tape, then stops. When I release the two buttons – it begins play. I’m looking for answers. I have had the row of buttons removed (very nice modular design – I simply love it) – but contacts seem fine. You were *given* a Studer A80? Wow that is amazing. That sort of things never happen to me. ? You have a great friend! About your problem: it could be related to the transport electronics. I don’t suspect it to be the buttons. 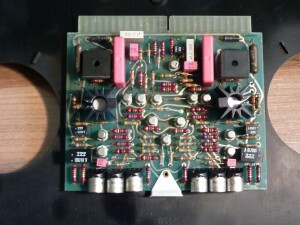 The transport electronics are located on some plugin cards in the machine, and also the big capacitors (the ones you see in the photo) play a large role in the tape handling. Any of that could be faulty. And after that has been repaired, tape handling calibration is absolutely necessary. After that, the tape handling is super-smooth again. Read the Service manual and get to it, I suppose. Or if that is a little bit out of your league, try to contact someone nearby who can help you or do the repairs for you. The studer list is a great resource. Google it. I have very nice friends. I also now have a very fine hobby. I’ll be changing capacitors, a couple of relays and cleaning and lubricating for the next few weeks, I suppose. Then I’ll look into calibration. Right now it runs smoothly. I’m preparing by reading the manuals. I actually printed the whole thing and put it in a binder. Thanks for your feedback on my problems. Listening carefully. I can do good soldering and I have a multimeter and an occilloscope, so let’s see if I also can do audio-calibration soon. ? This machine lends itself to turning on too may calibrations. So far I’ve shyed away from it, as I believe I would very soon run into “chaos” by fiddling with all those adjustments. Do I understand correctly that the problem is fixed now? I hope so! I’m interested in a Studer A80mk2 2inch 16ch. Ik wondering which kind of things I should keep in mind before buying the machine. Any tips and advice would be great! First, what is the need for you to buy the machine? if it is for a professional studio, to do serious recording work on it, the requirements are probably different than when it is for other use. Also, what is the price? If it is cheap, you can not expect as much as when they are asking a lot for it. You will need to check if the machine is in good condition. Check the heads. Is it in working condition? Do some tests with it. Do all the channels work? Can it be calibrated? When was it last serviced? Are there known issues? A lot of things can be critical on this machine. I have heard of power supply issues, capstan issues, channel issues, pinch roller issues, bearings, audio cards, you name it. But the upside is, that almost all things are repairable, so that need not be showstoppers. You should either buy it from a respectable and knowledgeable seller, that you can keep in touch with, or have a friend technician come with you to take a look at the machine. Fortunately, there is a LOT of help available online, as the Studer community is very large and active. Heads relapped as new condition. Complete with a Channel Remote Control and a Tape Transport Remote. All in the most perfect condition you can imagine. The machine is for almost a year not in use. Hi Philip, I am a colleague from the analog audio meets. Best pros are the way it handles (old) tapes and the utterly nice sound. great dynamics, but always smooth. a real master of a machine. About your problem: I’m not sure how to fix that, I have no experience with that. I found some suggestions on the internet about a misaligned sensor. Also you can check out the Studer Yahoo group located here: https://groups.yahoo.com/group/STUDER. That is where the REAL experts are…… and they are really helpful. I am looking to buy a Studer A80R too. I’ve found one for a reasonable price but it has developed the same fault as yours being the motor card. The left hand reel wasn’t working properly. They are currently getting the card repaired but I’m now thinking that it could be the main power caps (like yours) which are causing the problem. I’ve not bought it yet so I’m open to more information on owning such a machine. It won’t have a hard life as it will be used in my home and studio occasionally. I’ve just requested to join the yahoo group too. Any more information would be most welcome. It also depends on how much you want it and how much the unit costs. I really really really wanted it. A few years ago the prices were not as absurd as they are now. Fortunately I could fix it. Sorry about the delay, I only just noticed your reply. I’m in the UK. It looks in good fair condition for the price, needs some cleaning etc. Do you have an email so we can chat easier?